This was an attempt to get ahead of the game. The Mazda2 1.5 Activematic was about to be launched in the UK, but it was already available in Thailand. So that's where I drove it. When I originally tested the Mazda 2 three years ago, I loved it. 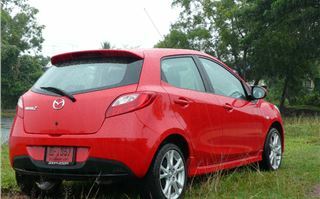 Especially the 1.3TS2 that seemed to have a perfect blend of performance, handling, gearing and economy for a small hatchback. I found the Fiesta less characterful in comparison, even driven on exactly the same roads in Italy a year later. 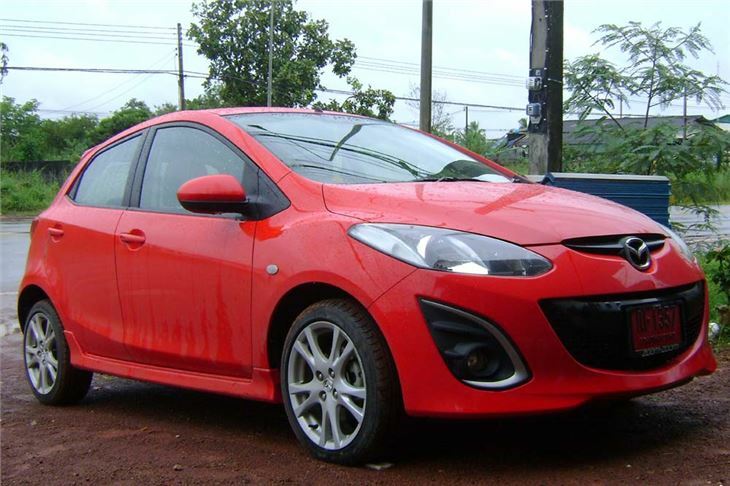 The Mazda2 originally came with a 75PS chain cam 1.3, an 86PS chain cam 1.3, a 103PS 1.5 with slightly shorter gearing, and a 1.4 68PS diesel. Since then the range expanded, to include a 90PS 1.6 diesel. 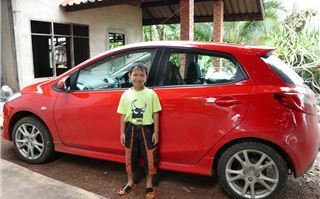 But the UK never got the 1.5 4-speed ‘Activematic’ automatic, which is the subject of this test in Thailand. 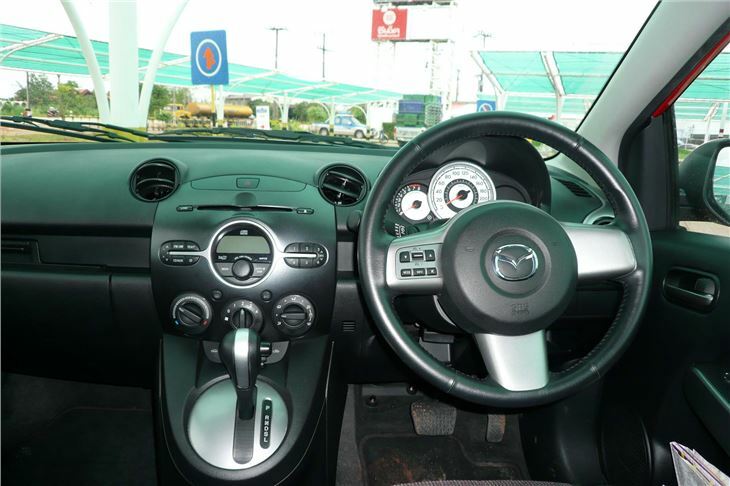 All too often a small automatic either comes as an automated manual or as a CVT with all the fun of driving it extracted like an unpleasant encounter with a dentist. So what I wanted to find out here was if a small automatic can deliver the two pedal job and still provide some enjoyment. 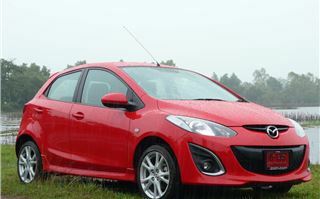 The Mazda2 has just had a facelift and a general revamp. All engines are brought up to EU5, which has meant a slight power decrease for the petrols and a 5PS increase for the 1.6 diesel. The 1.3s are now 119g/km, so band C £30 VED. The 1.6 diesel is now 110g/km, so Band B £20 VED. And the 1.5 automatic is being introduced to the UK at 146g/km, which raises the VED to band E and £125. These cars should be arriving in the UK in November. 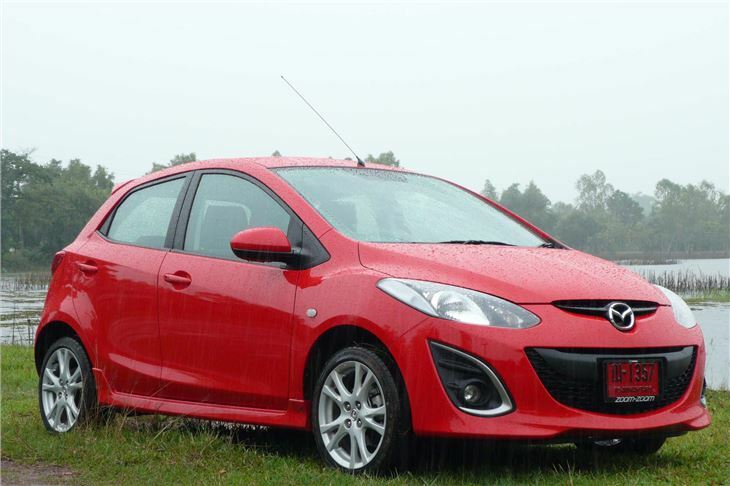 The 1.5 engine of the Mazda 2 automatic puts out 102PS, which is 8PS short of the Toyota Yaris/Vios 1.5 and 18PS short of the Honda Jazz/City 1.5. So Mazda has made up for that with the gearing. 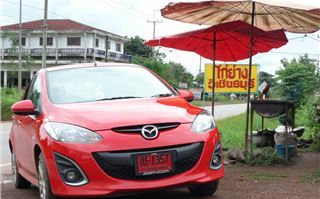 4th (top) gear of the Mazda2 auto works out at about 23 – 24mph per 1,000rpm against about 28mph/1,000rpm for the Vios, and the penalty of that is a brim to brim of 36.35mpg v/s 43 from the Vios. Still not bad, though, for a small, perky automatic while carrying four people and their luggage and being driven at between 70 and 80mph. 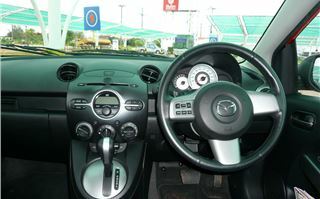 Like the Yaris/Vios (and like the Fiesta/Focus/Fusion 1.6 auto), there’s a button on the gearshift lever to lock out 4th. There’s also a ‘Sport’ position for the lever that holds 1st and 2nd longer and keeps it in 3rd. And 2nd is surprisingly long. If you’re stuck behind a truck and want to overtake from anything up to about 50mph the box drops down to 2nd at the slightest prod of the pedal. 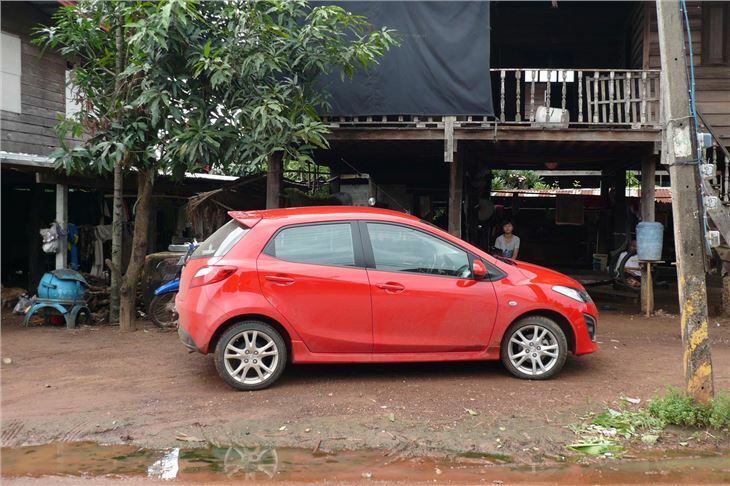 Though I still reckon a keen driver will get the most thrills from a 1.3TS2 manual, the Mazda2 1.5 auto doesn’t leave him or her locked out of the fun fair. It’s less refined than a Ford Fiesta, and the 195/45 x 16 tyres feel ridges in the road. 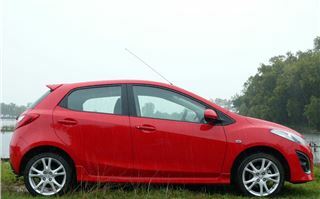 But at speed, for a small hatchback, it’s delightful. 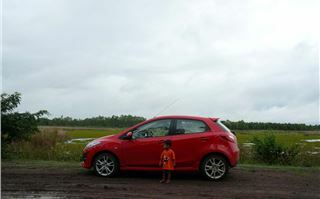 Somewhere between a Suzuki Swift and a MINI Cooper in the pleasure it gives. 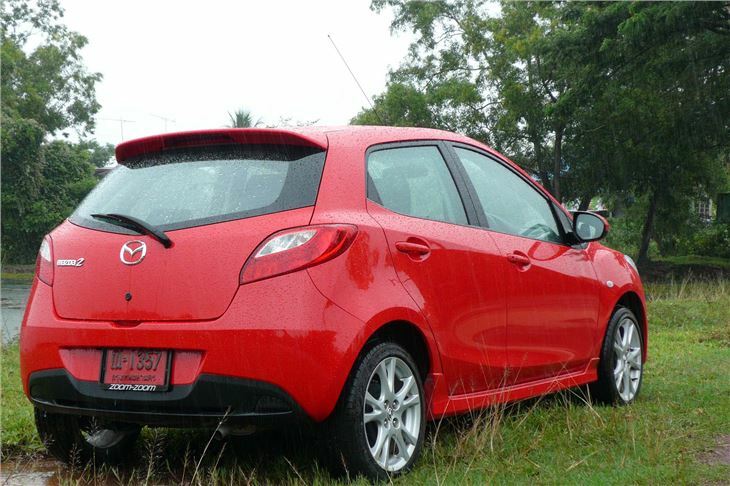 In the looks department, the front can be confused with a Fiesta, but the deeply sculpted sides, the cutaway side windows and much more coupe-like rear distinguish the Mazda 2. I think it’s a great looking little car. 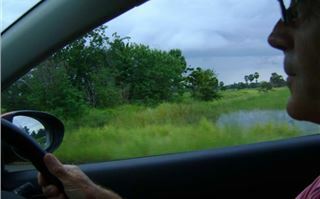 And those deep side windows give excellent visibility through large door mirrors. Inside, you’re not struggling for space. 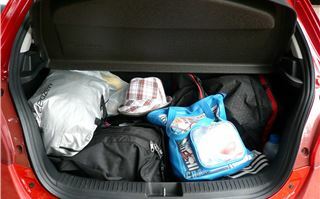 There’s plenty of head and legroom for four, and five at a pinch. 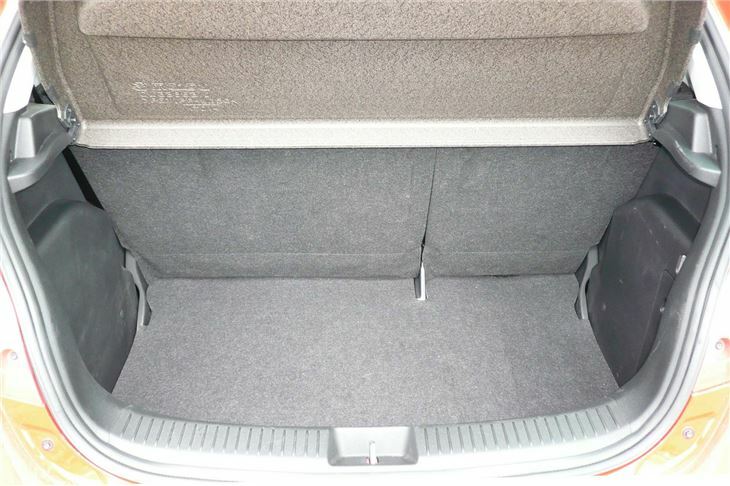 There’s a decent amount of bootspace, with a spacesaver spare under the floor (of our car, at least). 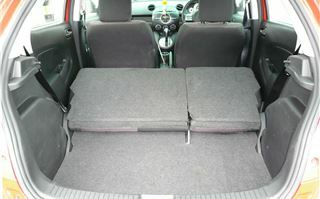 But the rear seat backrests do no more than split-fold forward, like a Fiesta’s, so this is no mini pantechnicon like a Jazz or a Note. 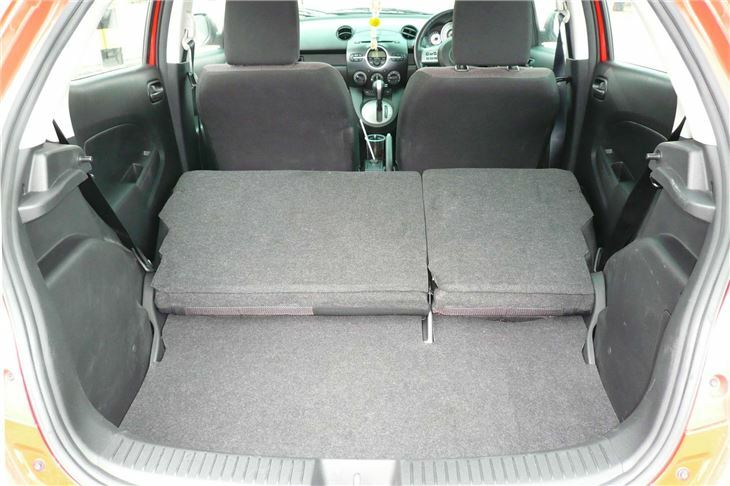 And if you’re expecting the disco dash of a Fiesta you’ll be disappointed. It’s a fully built in radio/CD MP3 player with an aux-in socket and a proper display, but it doesn’t look like a mobile phone. 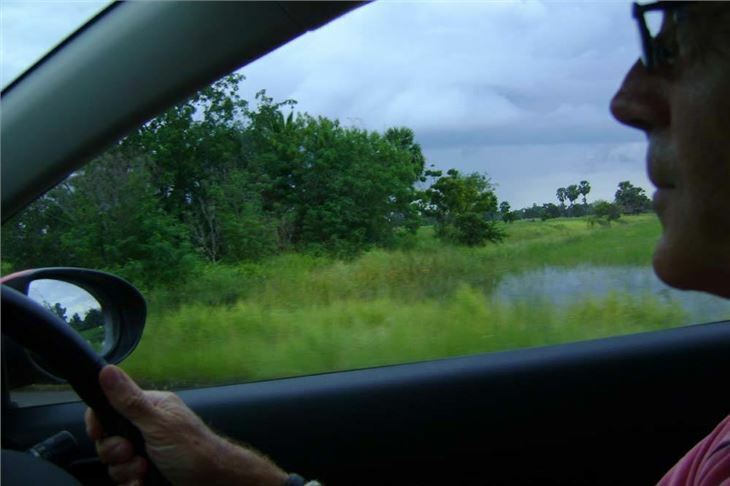 The big test of the car was something like 500 miles in a day, driving through appalling weather without a twinge. But out alone on almost completely clear, decently surfaced, dry roads I could really have some fun trying to find its limits and not quite getting there. 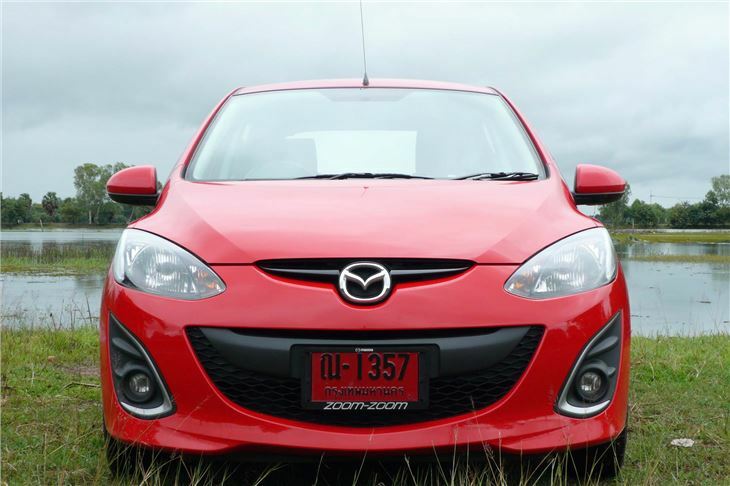 Very often cars don’t drive as well as they look, yet that isn’t the case with the Mazda2. It goes and handles as well as it looks, and, hand on heart, you can’t say that, for many other small automatics. 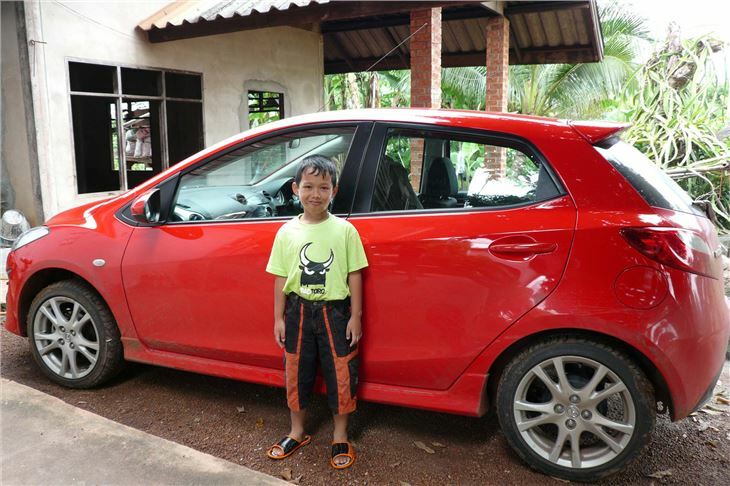 This test was uploaded on Sunday 17th October, after which we had to get the car back to Bangkok (Krung Thep) from a village called Bang Khok Si in Sakhon Nakhon province. 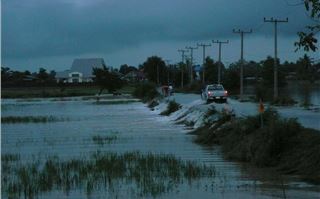 All went well, until we hit the devastating ‘nam tuam’ floods west of Korat (Nakhon Ratchasima). 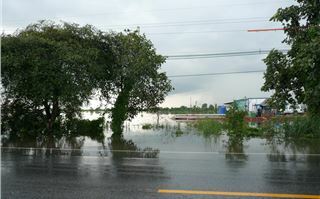 That meant a diversion back up Highway 2 to Highway 205, which itself was flooded. 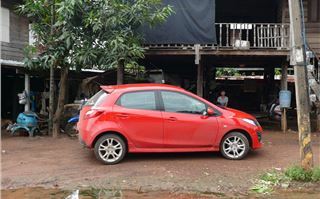 To make our way round that we took the 2067 to Nong Sung, then along a minor road to Non Thai where we rejoined the 205, thanks to Fon Promji’s excellent understanding of Thai directions and maps. We then had to battle through occasional very heavy rain and minor flooding to Chai Badan in Chayaphum, and profuse thanks here to the initiative of a sensible police traffic officer who escorted a convoy of buses, trucks and cars including ours through the twisting mountain pass in treacherous conditions, keeping our speed down to a sensible 60 – 80kmh and making sure we all got through. 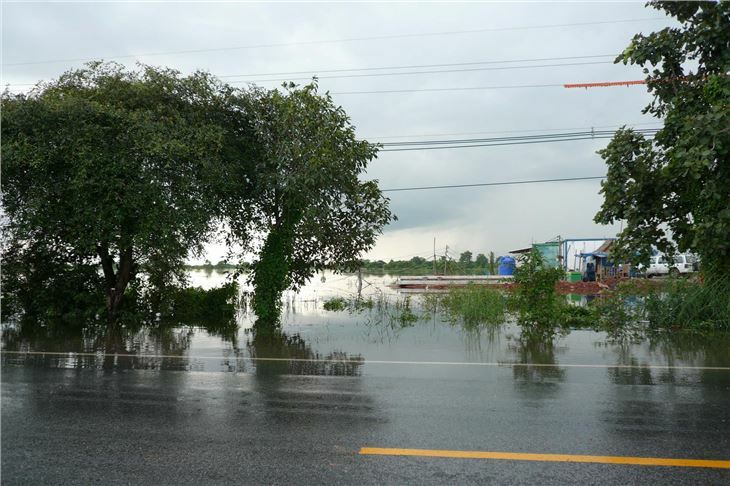 South of Chai Badan, the 205 was again flooded, so we had to switch to the handily parallel Highway 21 down to Saraburi where we merely needed to wade through about a foot of floodwater to get back onto Highway 2 to Bangkok. 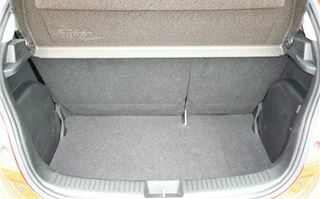 Despite 800 kilometres and 10 hours solid driving I still stepped out of the car twinge-free, which says a lot for the seats. 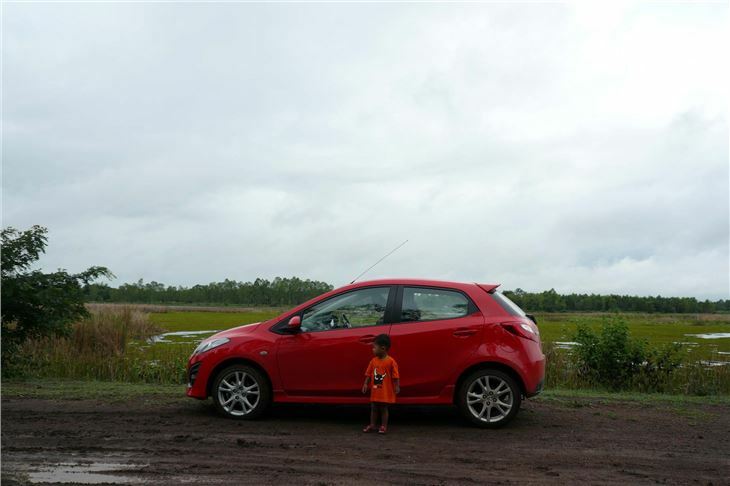 Altogether, over about 1,800 kilometres including rain and flood, we averaged a still creditable 36.06mpg with no trouble. That finally came after refilling the car and having it valeted to return to Mazda’s Lake Rachada offices when I got stopped by a cop on Sukhumvit shakedown duty just one kilometre from Mazda’s office. So, good cop, bad cop, but the bad cop didn’t push his luck. 4-5-2011 Footnote: On a sunny day in Surrey on UK spec 185/55 R15 tyres a Mazda 2 1.5TS2 Activematic averaged 44.6mpg over 18 miles, from a cold start.